I ran back to back overnighters Wednesday and Thursday night and the quick turnaround made it tough to post in between trips. The fishing was pretty good and we had some awesome fishing. The Full Moon is July 31st and I am always curious to see what kind of fishing it brings. Wednesday night we ran a trip on Justified. I mated for Captain Joe Trainor and we had a group of guys along with us who fish with us regularly and have fished with me in the Bahamas and Grenada. Needless to say, they are my favorite group, and they are pretty lucky on top of that. We got on the troll around 3pm in the Lindenkohl and conditions were not great. We did manage to get a white marlin which turned out to be Chris’s first white marlin. I actually am just remembering now, he didn’t jump in – I’ll have to get him in the water next time I guess. Action was slow otherwise so we deep dropped for tilefish. 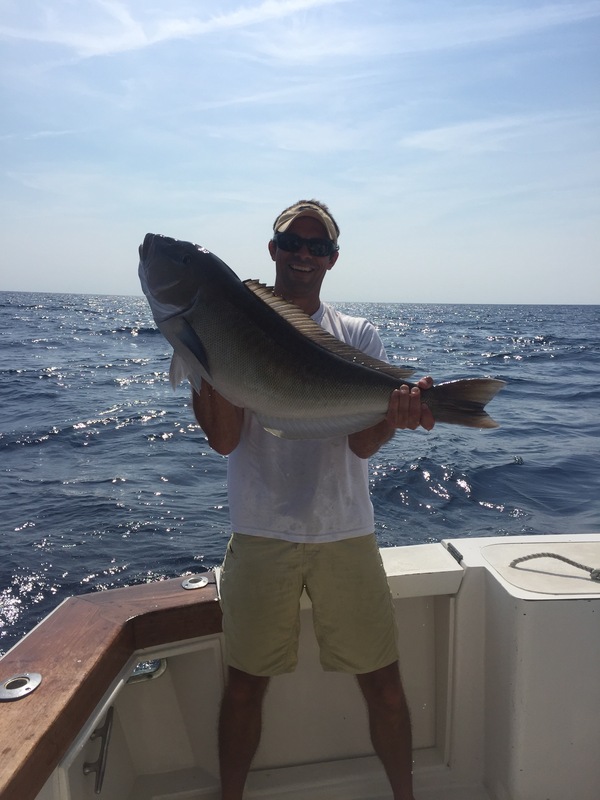 Bill got a really nice Blueline Tilefish that ended up being 2 lbs shy of the world record. Around 5pm we got back on the troll. The whales were pretty active around 6:30 and a friend of mine had a bigeye on the jig but didn’t boat it. As it got closer to dark the whales scattered which wasn’t a good sign, BUT we lucked out and WHAM, the left flat goes off and we were on a bigeye. 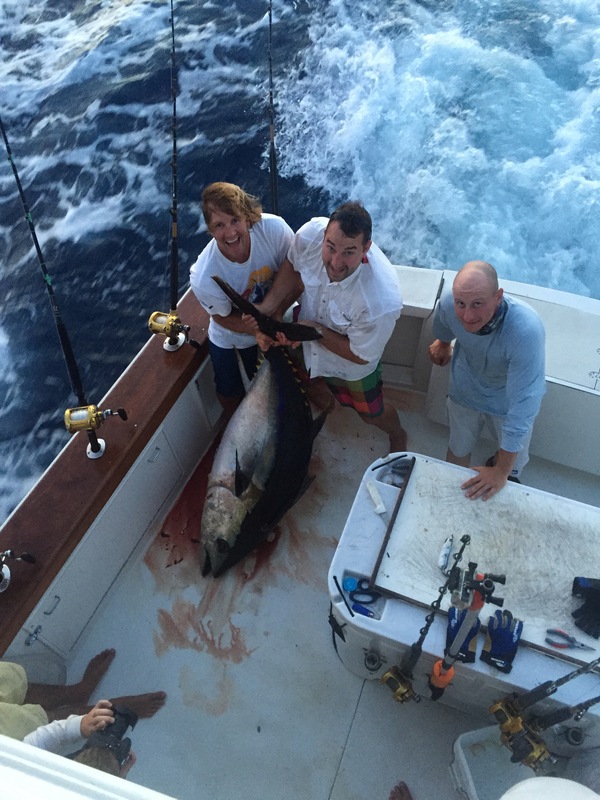 Todd beat the fish in 20 minutes and we boated a nice bigeye in the lower 200# range. We trolled a little more into the dark without a bite then got on a drift for swords. 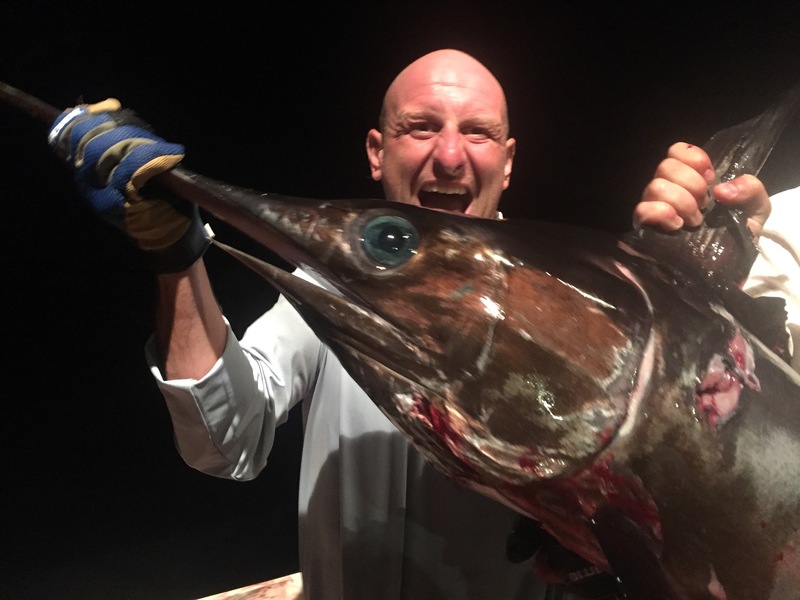 I sent down the first rod about 200 feet with bigeye belly and skirt and as I was setting up the second rod we got that tell-tale swordfish tap and finally the fish committed. Andy was on his first ever sword and we got that 60-70 pounder in the boat! We went on to get 3 more bites hooking into one, but after 15 minutes, the swordy decided he wasn’t going to let us catch him and completely spooled us. That was a first for me. Very fun trip! 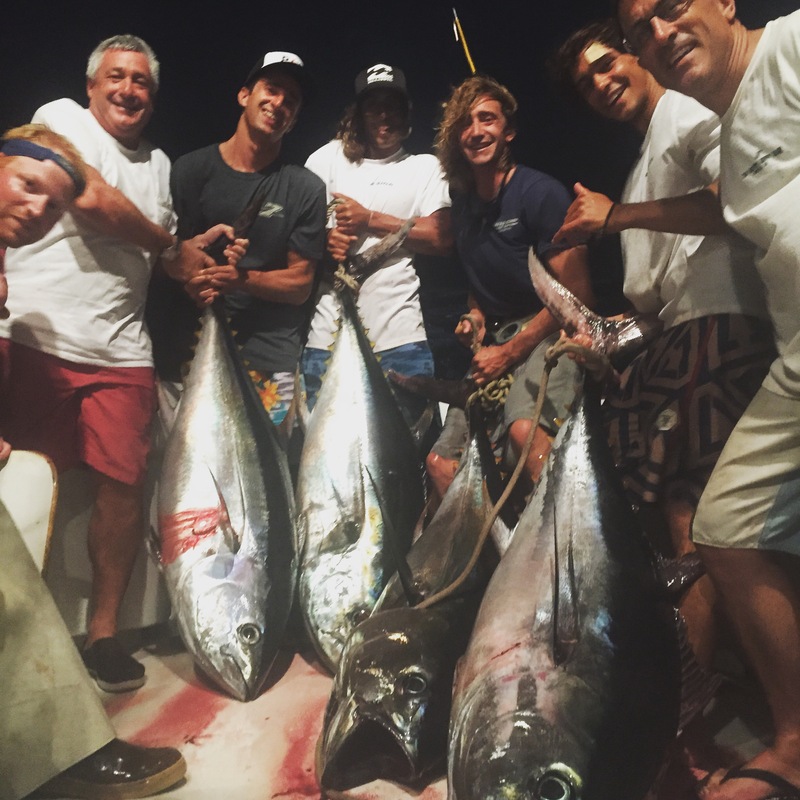 Thursday I ran Low Profile with Tyler as my mate and we headed back out bigeye hunting. We tried to pot hop for mahi right away and came up with a few, but there weren’t many mahi on them. As I crossed the canyon headed to try some other pots we ran over the pilot whales and they were packed in tight and active. We got on the troll but could not buy a bite, but around 8:00pm we got 4 big bites and had 3 come tight. Game On! After an hour and 15 minutes we had all three bigeyes in the boat! What a great feeling. 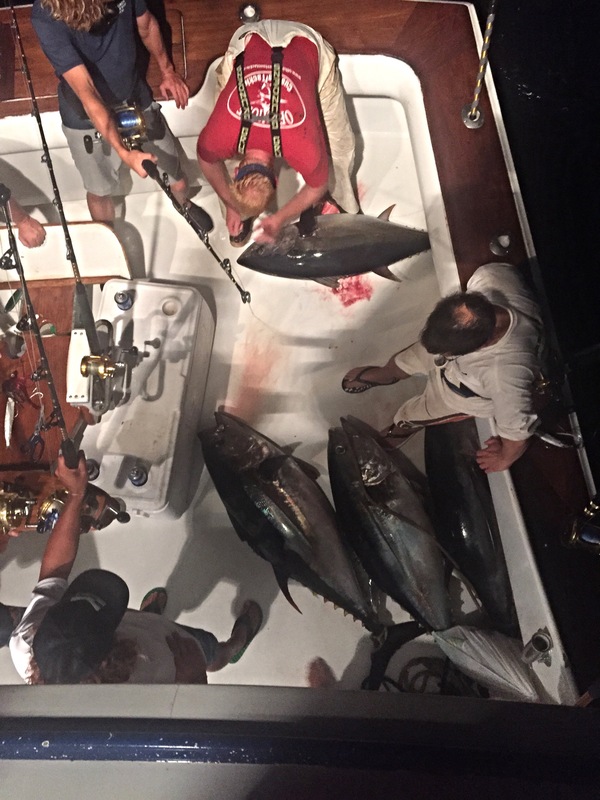 We got our lines back in and got on the troll in the dark and after 15 minutes the right long rigger goes off and we have another bigeye on. This one was feisty or our crew was just spent after whacking 3 bigeyes a few minutes earlier, but we did manage to get this 4th bigeye in the boat a little after an hour. Great crew of guys and good anglers as well helped our ratio be 100%. We laid up overnight and tried 4 different drifts but no action from any swordfish.